Nortriptyline hydrochloride is a medication approved for treating depression in adults. A type of tricyclic antidepressant, nortriptyline is available in generic form and as the brands Aventyl and Pamelor. In addition to treating depression, doctors prescribe nortriptyline for several off-label uses as well, including relieving chronic pain, preventing migraine headaches and helping people quit smoking, according to eMedTV. Nortriptyline is associated with many side effects, including both weight loss and weight gain. Nortriptyline works by increasing chemicals in the brain that help to elevate mood. It mainly affects serotonin and norepinephrine, and to a lesser degree, dopamine. Nortriptyline inhibits the reabsorption, technically called reuptake, of these chemicals by brain cells, explains the Mayo Clinic. Tricyclic antidepressants are named for their chemical structure, and they were an early development in medication for depression. Before the U.S. Food and Drug Administration approves a medication for a certain condition, clinical studies test the drug with thousands of participants to confirm its effectiveness and to identify the incidence of side effects. In clinical studies with nortriptyline, according to eMedTV, some participants reported weight gain and others weight loss as side effects. A study published in the March 2000 issue of the American Journal of Psychiatry compared nortriptyline with the drug fluoxetine, commonly known as Prozac, for treating depression in 104 stroke patients over 12 weeks. 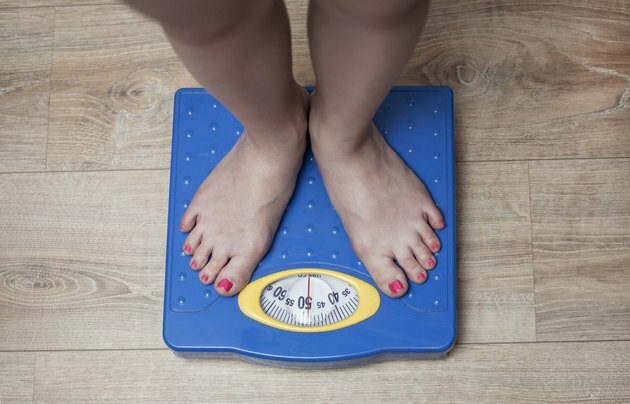 Fluoxetine use resulted in a weight loss side effect of 15 pounds on average, but weight loss did not occur with nortriptyline or with the participants taking a placebo. In this study, nortriptyline was superior to fluoxetine in relieving depression. Trying to use nortriptyline for weight loss is not advisable because weight gain appears to be a more common side effect than weight loss, and because the drug causes many other side effects. The Mayo Clinic, for instance, does not even include weight loss as a possible side effect of this medication. Research published in the October 1984 issue of the Journal of Affective Disorders evaluated 40 depressed individuals taking tricyclic antidepressants, including amitriptyline, imipramine and nortriptyline, over an average of six months. Participants experienced an average weight gain of 1.3 to nearly 3 lbs. per month. Additionally, these individuals developed increases in preferences for sweet foods. Half the participants discontinued treatment early due to weight gain. Significant weight loss occurred once they stopped taking the drug. Tricyclic antidepressants such as nortriptyline affect other cell receptors in the brain besides those involved with mood-enhancing chemicals, which accounts for the many side effects, according to the Mayo Clinic. Besides weight loss or gain, some possible side effects include dizziness, drowsiness, lightheadedness, confusion, constipation, urination problems, increased perspiration, dry mouth, erectile dysfunction and changes in blood sugar levels. Antidepressants may increase the risk of suicidal thoughts or actions in children, teenagers and young adults. EMedTV: What is Nortriptyline Used For?